An entertaining, deeply informative explanation of how high-level financial crimes work, written by an industry insider who’s an expert in the field. Financial crime seems horribly complicated, but there are only so many ways you can con someone out of what’s theirs. In Lying for Money, veteran regulatory economist and market analyst Dan Davies tells the story of fraud through a genealogy of financial malfeasance, including: the Great Salad Oil swindle, the Pigeon King International fraud, the fictional British colony of Poyais in South America, the Boston Ladies’ Deposit Company, the Portuguese Banknote Affair, Theranos, and the Bre-X scam. 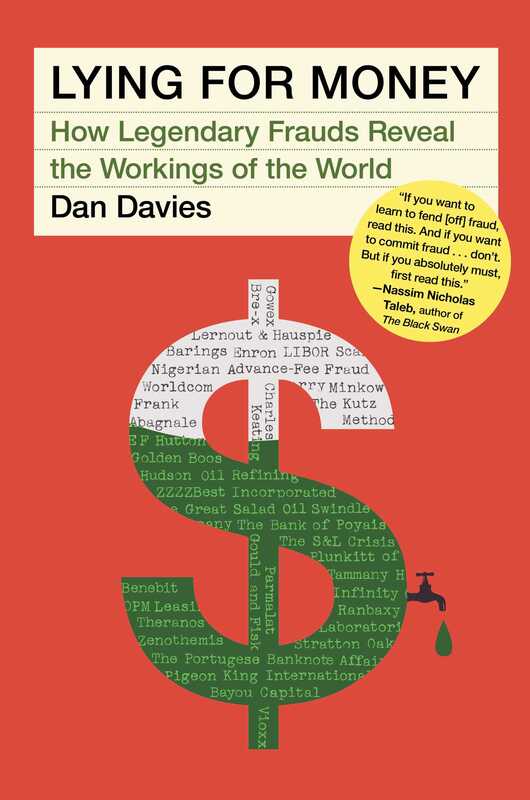 Davies brings new insights into these schemes and shows how all frauds, current and historical, belong to one of four categories (“long firm,” counterfeiting, control fraud, and market crimes) and operate on the same basic principles. The only elements that change are the victims, the scammers, and the terminology. Davies has years of experience picking the bones out of some of the most famous frauds of the modern age. Now he reveals the big picture that emerges from their labyrinths of deceit and explains how fraud has shaped the entire development of the modern world economy.